‘Tis the season to hang holiday wreaths again. Time, also, to fill the home with the aroma of baking Christmas cookies. And hopefully have many reasons to be of good cheer! 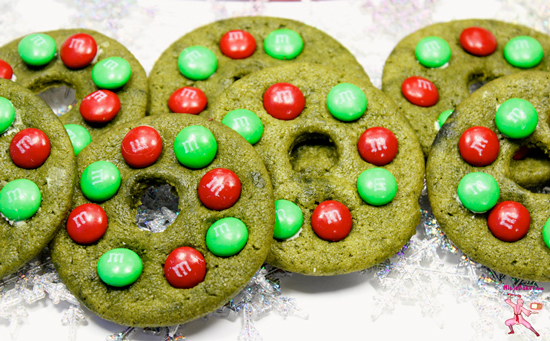 Joys to the World: Matcha green tea, M & M chocolates and Christmas cookies! Gourmet types (like Liz) might shun shortcuts in the kitchen. 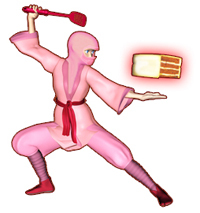 However, this Ninja Baker slipped into a market and picked up ready-made cookie dough. I rolled out the sugar cookie roll; kneaded in matcha and powdered sugar. Then, cut out circles and punched holes in the middle. Matcha cookies crowned with chocolate candies. Happy Christmas! Ninja Note 1: The powdered sugar balances the bitter matcha taste. Allegedly powdered sugar in the dough is supposed to prevent the spread once heat hits the cookies. Even with the cautionary step of freezing the cut-out cookies overnight, the matcha cookies still expanded in the oven. Ninja Note 2: The wreath holes require an additional punch in the middle upon their exit from the oven. Japanese matcha is not everyone’s cup of tea. So, I also created Japanese Plum Wine Cookie Wreaths. A tickle of wine candy cackles atop each cookie. 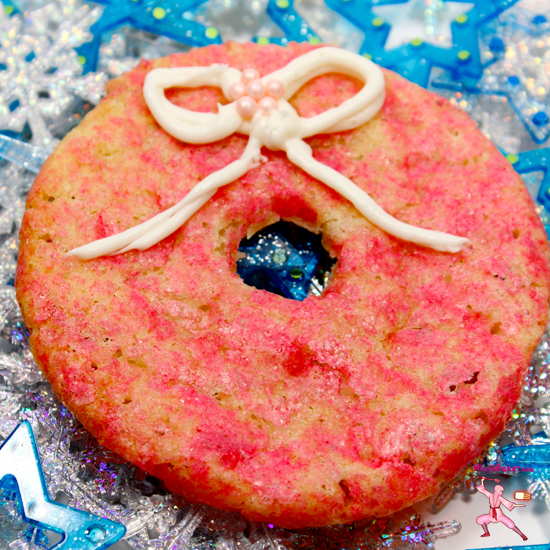 (Albeit wine cooks out in baking; Japanese Plum Wine Wreath Cookies are not kid-friendly.) 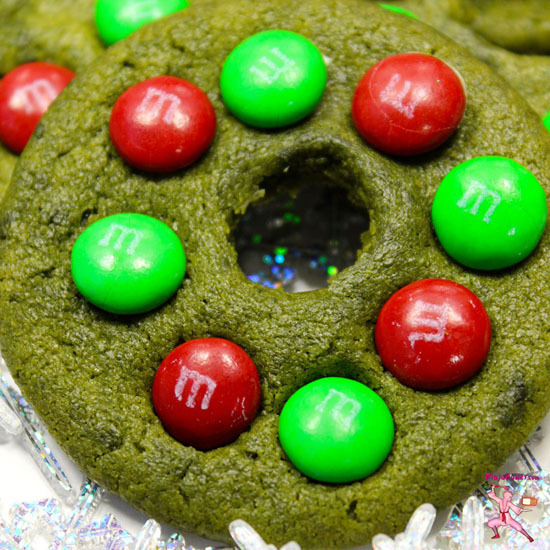 This cookie also expands in baking so the notes for the Matcha Green Tea Holiday Wreath Cookies apply…Next time, I’ll follow the lead of the gourmet types and make my own sugar cookie dough foundation! The firmer dough will allow the wreaths to keep their shapes. Sometimes short cuts lead to more work...Do the results of this baking adventure disappoint or discourage me? No! The holidays are filled with good cheer. If I choose to open my eyes, there is so much to celebrate! 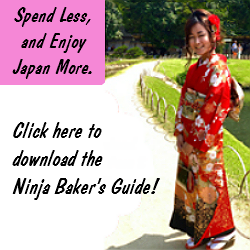 The Zen of the Japanese tea ceremony is delivered in the Ninja Baker's matcha cookies. Just as a sweet is offered with green tea in a traditional Japanese tea ceremony, powdered sugar in the cookie dough balances the slightly bitter green tea powder...And produces a perfectly delicious cookie! Between wax paper, roll out the matcha sugar cookie dough. 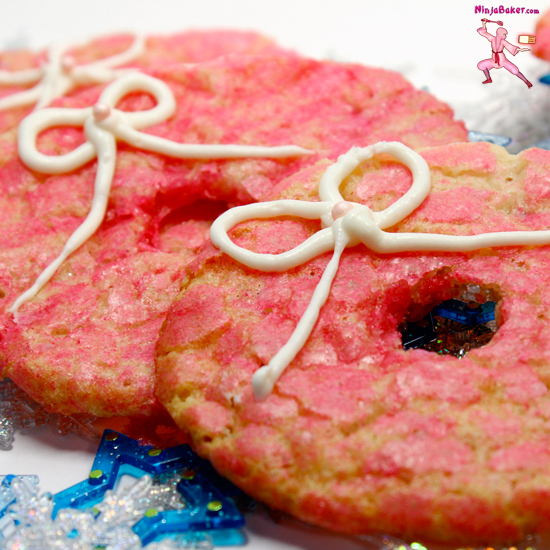 Cut out circles with a biscuit cutter. With a smaller circle, punch out a smaller circle in the centers. Place on parchment lined cookie sheets and freeze overnight. Bake in a 350 degrees oven for 12 minutes. When the cookies come out of the hot oven, reinforce the center circles. Press on the M & Ms.
A tickle of Japanese plum wine candy cackles atop each cookie. Crisp, pretty and a pleasure for the palette. 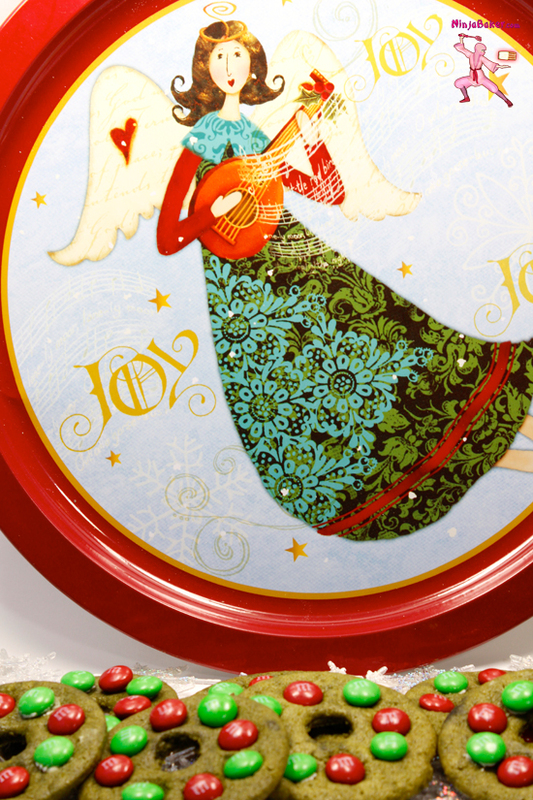 This cookie will bring holiday cheer to the grownups. Whisk the sugar, wine and drops of pink food coloring together. Paint the mixtures onto ½” slices of cookie dough placed on a parchment lined cookie sheet. Pipe vanilla ribbons onto the cookies with a writing tip. Wishing you good cheer during the holidays and always.